Are you trying to decide how to test your mobile app? Maybe you’re lost among the dozens of mobile app testing tools and don’t know which to choose? If so, then this article with a complete list of best testing tools for both Android and iOS is for you. As the number of smartphone users grows every day, so does the number of developers. And where there are lots of developers and applications, there must be lots of QA engineers, as an app’s quality is the key to its success. QAs and developers are in a constant search for the best mobile app testing software, and choosing one or several has become a big problem. Here are some other difficulties related to mobile app testing according to senior IT management executives. 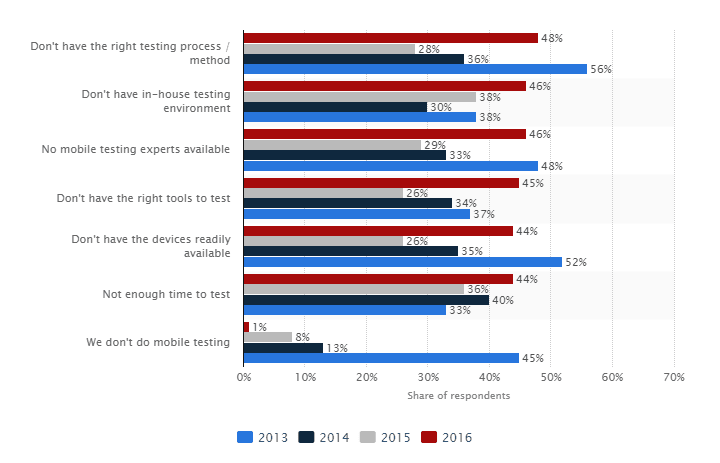 As you can see, the vast majority of development companies performed mobile testing in 2016, and their number is growing. However, the problem of finding the right tools for mobile application testing has become a serious obstacle for developers and QAs. 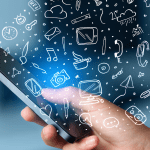 In this article we’ve made a list of the best mobile application testing tools on the market. Here you’ll be able to find out, which ones are the most popular among developers and QA engineers, so let’s begin and talk about their pros and cons. These are universal testing tools for mobile applications on Android, iOS, and other platforms such as Windows and Blackberry. Ranorex is an easy-to-use paid automated tool for developing and managing projects with teams of developers and QA specialists. Eggplant is one of the most advanced mobile app performance testing tools. It includes a wide choice of tools for any kind of testing from functional to load. Eggplant’s instruments can function on their own or work with external tools in a common environment. SOASTA TouchTest provides full automated functional testing of mobile apps for sensor smartphones. Appium is probably one of the most famous tools for mobile app testing.
. It allows you to automate UI tests written in Cucumber. Robotium is one of the leading frameworks for automated Android apps testing. It can be a helpful part of any technique. Selendroid is one of the most powerful tools for different kinds of Android apps. Scirocco provides automated UI testing for Android apps. UI Automator is an open source framework for UIs with functional test classes. 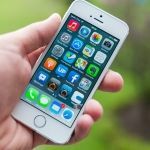 Here are some iOS app testing tools that are great for iPhones, iPads, and other Apple devices. KIF is a framework for integration testing of iOS applications. Also, it is one of the best mobile automation tools. It allows you to test cases integrations on Objective-C in iPhone and iPad simulators. 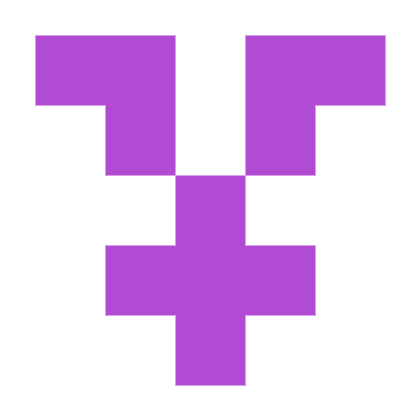 iOS Driver is an open source tool that’s able to completely integrate with the Selenium grid. TestFlight is a tool for iOS developers that lets you invite users to test your application. iOS UI Automation is an open source automation framework for iOS applications. 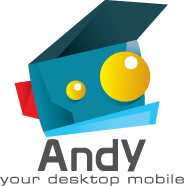 Andy is an emulator for Android applications with lots of capabilities. iPadian iPhone emulator is one of the best iPhone emulators for Windows. A/B testing lets you test several variants of the same feature or detail to see which looks best to your users. For example, you may have a button for ordering in your ecommerce application. Where should you put it? In the left-hand corner or the right-hand? Maybe on top or maybe at the bottom of the screen? A/B allows you to see which variant is best. Taplytics is a fully integrated platform for A/B testing that sends push notifications and offers mobile app analysis. It offers a wide range of instruments for app optimization. Apptimize enables you to make changes and implement new features for certain customers to test before you show them to everybody. Mobile services and providers for testing mobile apps are usually universal and complex. 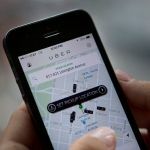 The problem for many companies is that they don’t have enough resources or devices to test their applications properly. A single provider can become a whole testing cloud laboratory with all the necessary devices. Testing laboratories usually provide all kinds of testing and offer full support. However, they’re sometimes rather expensive. The Ubertesters platform executes and controls beta testing of your mobile applications. Applause is a big mobile testing service with more than 200,000 users who provide in-the-wild testing services. It is also one of the best mobile security testing tools. UserTesting is a platform that allows you to get insights about your application from users. Here is our list of mobile application testing tools. You can use them as part of your iOS or Android app testing technology. They’ll help you improve your code, making sure it meets all the requirements and works perfectly. Of course, none of these tools is perfect, and each has its strong and weak sides. We hope that this article helps you better understand the world of QA testing. The best decision is to use several instruments together for the best mobile application testing methodology. As a development company, we spend around 30% of our total development time testing out products to ensure the best quality and performance. If you have any problems with choosing a testing strategy for your app, feel free to contact us.